Its that time of year again! Time to take a good hard and unbiased look at each of the 11 Big Ten coaches and asses their current situations, the 2010 outlook and what it will take to either get them fired, or keep them safe. This little pet project of mine is certainly nothing unique to just this blog, many blogs do this. But it's a something of a springtime ritual around here and we like doing it. Special bonus this year, we'll also be looking at Notre Dame coach Brian Kelly. No real mystery about his job security as he's a rookie coach, but since Notre Dame is practically knocking on the Big Ten's door and annually plays 3-4 Big Ten teams...we might at well treat them as a Big Ten school for this assessment. Same scale as we used last year...with one level of safeness added...BLUE! How this man survived 2009 is beyond me. Last year we had him labeled orange. Coming off of a very good 2007 (Rose Bowl), and then struggling in 08, but still having Juice Williams at QB, I would have thought expectations would have been higher in Champaign for 2009. Going 3-9, they lost all of their big games in 09 except for Michigan at home on Oct. 31st. I have a hard time believing beating the 10th place team in the Big Ten saved Zook's job. 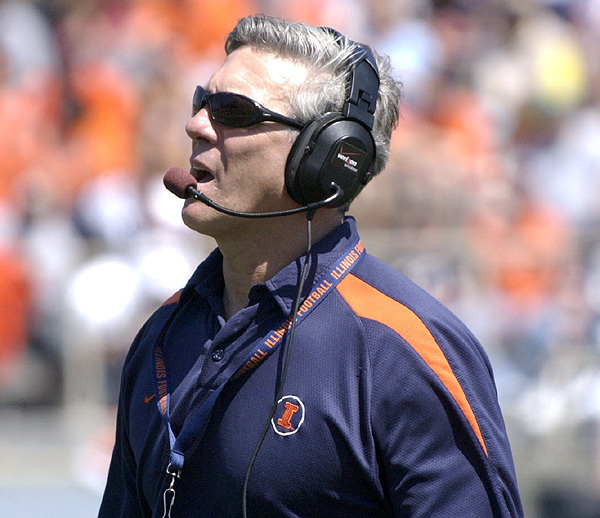 Zook makes $1.6 annually, and his current contract goes until 2014 [Link]. Last summer he received a one-year extension. It may be possible that Illinois couldn't afford to fire him due to some amazing termination clause in his contract. Who knows. 2010 has to be the year the rubber meets the road as far as Zook being fired. He's going to have a tough time replacing Juice Williams...just like he did replacing Mendenhal in 08. Anything less than 7-8 wins and the boosters will literally set Memorial Stadium on fire. And honestly, I don't see that many wins on their schedule. Bill Lynch yelled a lot in 2009. 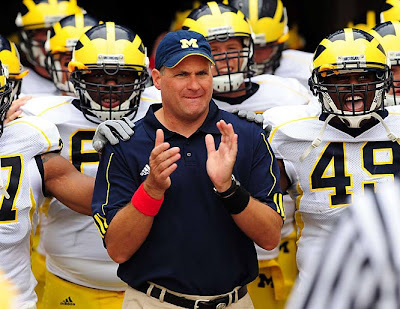 He surely yelled like crazy at Michigan in late September when they started off 3-0 and came oh-so-close to knocking off the red-hot 3-0 Wolverines in the Big House 36-33. Apparently, yelling lot means you care a lot. In that case, Lynch cares more than any other coach in the Big Ten. It's just too bad he's at Indiana. Indiana is just not a great football school. They went to a bowl in 2007, which was pretty good - but that was with former coach Terry Hoeppner's players and schemes. Since then, they've gone 7-17 overall and 2-14 in the Big Ten. Lynch currently makes $675,000 a year, and his contract ends in summer 2012 [link]. Last year we said he needed a great year, and he didn't deliver. Its okay though because expectations are really at an all-time low. 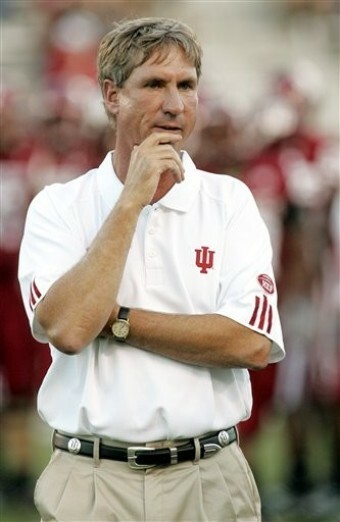 If 2010 isn't another bowl year, which it won't be, Lynch will likely be axed. 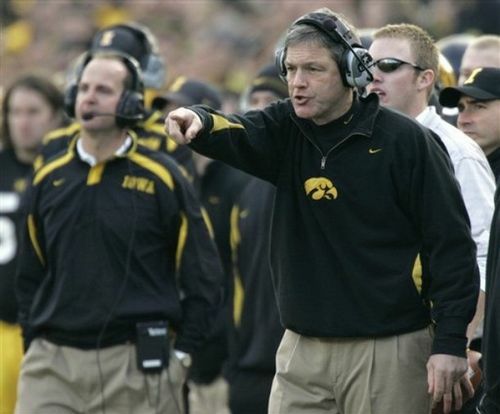 If there is a model of safety in the Big Ten coaching fraternity, its got to be Kirk Ferentz. 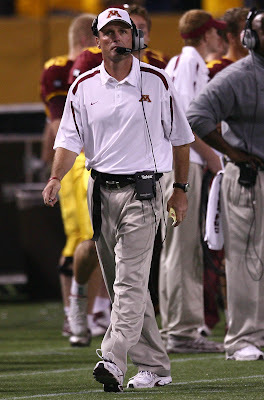 He's steadily improved from a 6-6 2007 record, and in 2009 his 11-2 record and win in the Orange Bowl against Georgia Tech was considered enough to be named 2009 Big Ten coach of the year. In 2009, Iowa started the season an impressive 9-0. Winning big games against Michigan, Penn State and Wisconsin, they stubbed their toe against Northwestern. And then the following week took tOSU to overtime at the shoe toilet-bowl before losing 27-24. A late season win against Minnesota gave Iowa a shot at a BCS bowl, and they delivered a huge win for the Big Ten against #9 Georgia Tech 24-14. Ferentz's $3.3 million annual contract was extended last year to go until summer 2016 [link]. After seemingly yearly rumors about him leaving for the NFL, it seems clear that he's fairly comfortable in Iowa City, and Iowa in very comfortable with him. He's got a bit of rebuilding to do for 2010, and will have to do it fast in order to remain in the top 3 of the Big Ten. I have no doubt he will do it, just may take a little while. I expect a successful year in Iowa City, but not quite as successful as 2009. Many Michigan faithful, myself included, hoped that the 2nd-year turnarounds that Rodriguez was famous for would occur in Ann Arbor. It didn't. 09 was a struggle. But, coming out of the gate 4-0 temporarily quieted the critics. But then the wheels fell off the bus once the meat of the Big Ten schedule hit. To be fair, last year we said that 2010 would be the "put up or shut up" year for Rodriguez. And I still believe that. We said that he needed a good year in 09 (at least a bowl), and since he didn't get it, that really turns up the heat in 2010. Struggles on the field, and some NCAA attention off of it have really made Rodriguez a punching bag for fans of the old administration. But like it or not, Rodriguez will be the coach in 2010...no matter what. He has the full support of both UM President Mary Sue Coleman, and new AD Dave Brandon, so he's safe for now. He must beat Sparty this year...no question. tOSU is going to be a tough one, but not impossible. If he can swing both of those as well as win the games he's supposed to win, 2010 could be the season Michigan fans have been waiting for. I don't expect a Big Ten championship or an undefeated season, but 8-9 wins is mandatory for Rodriguez to return for 2011. Rodriguez's current contract is $2.75 million a year and goes until 2013 [link]. 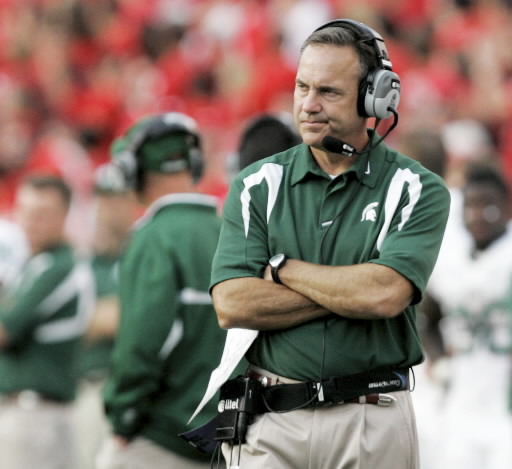 I'll admit it's tough for me to give an unbiased review of Mark Dantonio. I'm not exactly a huge fan of this guy. But, for the sake of being somewhat journalistic, I'll do my best. First off, 2009 was not a good year for the Spartans. Sure, they knocked us off in East Lansing and thwarted another late surge from super-freshman Tate Forcier...albeit an injured Tate Forcier...and in a driving rainstorm. 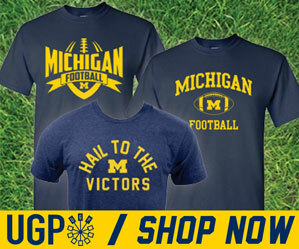 But they lost in humiliating fashion at home to Central Michigan on 9/12. That loss was followed by losses to Notre Dame and Wisconsin the following two weeks. Losses later in the season to Iowa, Minnesota, Penn State and Texas Tech in the Alamo Bowl capped off another year of pure mediocrity for the Spartans. If you take away the Michigan win, the best win on their schedule was maybe Northwestern. Off-the-field issues were the major focus of this team this year. An "on-campus altercation" occurred towards the end of the season, and about a dozen or so players were suspended. I don't remember exactly what happened, but it had something to do with drunk players getting in a fight at a dorm on campus. I don't know if arrests were made, but at this point, does it really matter? It seems fairly evident that since this was not an isolated incident, that Dantonio does not really have full control over his players. I'm not sure what the feeling is in East Lansing right now. On one hand, he's beaten Michigan two years in a row (but who hasn't? ), and on the other, he's still struggled to break the trend of mediocrity that has been around the program since the days of Bobby Williams. With that in mind, I'll say that this season needs to be a much improved year for Sparty. I know their tired of playing second fiddle to Michigan, especially since beating them two years straight. But the trip to Ann Arbor, ND and Wiscy at home and the season finale at Penn State will tell the tale of 2010. First off, I like Tim Brewster. I think he's a fine coach. He's done pretty well so far at Minnesota. I think his players like and respect him, the fanbase seems happy with him. They have a new stadium, TCF Bank Stadium, which replaced the awful HHH Metrodome (were Michigan never lost a game), so that's a huge plus for the program. All Brewster needs to do now, is win. 2009 was a so-so year. They beat teams like Syracuse, Air Force, Northwestern, Purdue, Sparty and South Dakota State. And they made it to the Insight Bowl where they lost to Iowa State by 1. Unfortunately, ugly losses to tOSU, Penn State, Cal ad Iowa labeled 2009 as a disappointment for the Gophers. 2010 has the potential to be a good year for the Gophers. They do host some pretty awesome opponents at their new stadium this year. Games against USC, Penn State, tOSU and Iowa are going to be huge draws for the program as far as TV exposure. For a program looking to make some noise, this is Minnesota's opportunity to do so. I believe if they can knock off at least two of those opponents, and then win the smaller games, Brewster might make a name for himself this year. You might laugh at USC, but I think this could be a great game, and a potential landmark win for the program. Michigan and Minnesota are on a break until 2011, so the Little Brown Jug is safe in Ann Arbor for another year. Part 2 of the 2010 Hot Seat Preview will post later this week. Good read man. It's nice to hear some other Big Ten opinions on Tim Brewster. Thanks Trevor. Is this your blog? If so, thanks for the link. Love the title of your site! Ha nope, not my site.